You won’t make fun of me, will you, if I tell you I sometimes act out what I’m writing? Usually I only do this in my mind, but if I’m having trouble choreographing a scene, I may well get up and see how it would work, pace it with the dialogue. At any rate, the best writers use their imaginations as much as they use words. They write as if they are the character, even characters they want to hate. (Caveat: we never hate any of our characters, not even the worst ones, because they possess a seed of ourselves and that’s how we are able to bear being who we are. Or that’s my theory.) If that’s not a kind of acting, I don’t know what is. How can you despise someone after you allow yourself to feel with his or her hands? How can you not round a character (even if she is modeled after someone whose bed you’d like to short sheet) when you allow yourself to imagine what this playground scene would look like to you if you were this woman who had just had a miscarriage? Come now, Dear Writer. Let us confess that the reason we write is to right our lives. Often we want to BE someone else, if only for a time. Perhaps we want to travel to a place or a time to which we have never been, and so we act as if we are there, witnessing every moment. It’s all acting. We never have to settle for what is when we can act as if, can write as if. We can live any life, love anyone, and try on any lifestyle we choose with no consequences. So the next time you get stuck while writing, act as if. Write as if. Live as if. I can’t finish those for you. To turn those fragments into sentences is yours alone. Action! P.S. 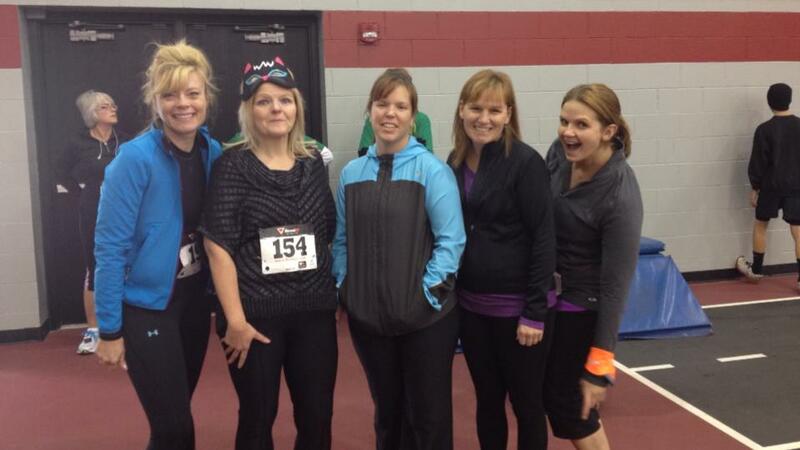 In case you were wondering about the photo, there I am in my cat mask with my writer friend Shirley Jump and running buddies at the Fright Night race. Both Shirley and I came in third place for our age groups. Score! I’m not writing a dissertation, so you might wonder why I recently picked up a book called Writing Your Dissertation in Fifteen Minutes a Day by Joan Bolker at the library. Of course it was the word “writing” that drew me. What kept me interested was its intriguing, fresh writing tips. A few months ago I had the marvelous opportunity to teach a writing class at my church. When I surveyed the participants, I discovered they were there for many different reasons. “That’s okay — writing is writing, in many respects,” I said. Reading this book confirms this for me, because Bolker’s tips ring true to me, even though I am primarily a fiction writer. May I recommend chapter six, “Interruptions from Outside and Inside”? Here she asks the reader to take a hard look at what is really outside of our control when it comes to writing. We all know about those “interruptions” such as social media and those fascinating, emailed newsletters that we just have to read right now. And don’t get me started on Pinterest! She references an essay by Anne Tyler that I’d like to hunt down called “Still Just Writing.” Even though I haven’t read it, I can imagine (because I adore Tyler’s writing) what it says. I wonder if she’s been questioned about the legitimacy of her work as I currently have. I’ve been accused of being unemployed because I made the leap to full-time writing. Yesterday I ended up working thirteen hours with only a brief break or two. Unemployed? Hardly. That is not to say that I don’t fall prey to those interruptions that others do: mail (I love all mail, email or snail), a phone call (although I try not to answer the phone while I’m working), and emails. So many wonderful emails to answer! If you need a kick in the rear, Bolker will do that. She recounts the story of an advisee she had who was 8 1/2 months pregnant. Bolker told her that was no excuse for not finishing her dissertation, and the woman did! Tough love, but someone’s got to do it. While it’s not the same, my last semester in the MFA program I attended I had the opportunity to present a novel for a novel-writing workshop led by an idol of mine. I quickly signed up for it, only to realize that the “novel” I had been working on was not what I wanted to present to her. This was a once-in-a-lifetime chance, and I didn’t want to waste it on something that was not the best, the truest writing I had in me. So. So I decided that I would write a first draft of this newest novel (thankfully the subject of the novel called to me at this very time…not sure I believe in coincidence) in, oh, less than eight months. I wrote in a dreamlike state, writing until my wrists ached. I think my maximum page count FOR ONE DAY was twenty three pages. This novel burned in me; this opportunity was truly that special to me. I lost weight. I taught in a trance. I quit going places or hanging out much with friends. Our house became, shall we say, pleasantly cluttered as I struggled to do the most important things — dishes, laundry, cooking. My husband helped out as much as he could, but he was working long hours too. The only thing I didn’t let go was my exercise regime. Most days. But that’s because that’s brain fuel for me. Yeah, yeah, I’ve told this before, but I just can’t believe I did it. I finished that draft. And a second. I am currently on the third draft and am still as excited about it as I was when I began. I think Bolker would approve. For me, perhaps the most meaningful section of Bolker’s book comes in her utter acceptance of an individual’s writing process. She suggests not fighting the monkey mind that wanders off, but to work with it. To either keep a list of those “I should” tasks that pop up, or to write what you’re thinking, no matter how off target it seems to be, and you might be surprised to see the connections your mind is trying to make. What a relief! So my mind (which ping pongs) is okay? In fact, those thoughts that seem wildly out of line with my writing might actually be my mind’s way of trying to classify its thoughts? Monumental! I can’t tell you how freeing that validation is. She’s saying we should trust our minds! Yes, even our monkey minds. If you’re not writing a dissertation, there are chapters such as “Your Advisor” that you can safely skip. I confess to doing just that. But if you need to feel better about yourself and your unique writing process, give this book a read. Who knows — maybe you’ll end up wanting to write a dissertation, even if you never do. For me this is more my philosophy of writing than a nuts and bolts list, although there are a few of those on there. 1. Have I engaged all of the senses? 2. Have I built anticipation and tension? 3. Have I created a plot that leads to the answer of a question? 4. Have I resisted the urge to describe too much? 5. Does every word belong? 6. Have I considered the sound and cadence of my words? 7. Do my characters live? 8. Are my characters complicated? 9. Do they make us see the world in a new way or in a new light? Do they confirm something? 10. Have I created a world? 11. Have I done adequate research, if applicable? 12. Have I taught and/or entertained my readers? 13. Does this work of mine make the world a more complete place? 14. Have I portrayed a facet of truth? 15. Is this my best effort? 16. Have I been fearless? 17. Have I attempted to address any weaknesses in grammar, style, etc.? 18. Have I been open to criticism and feedback from my beta readers without compromising? 19. Is my work original in every way? 20. Am I writing work that engrosses me? 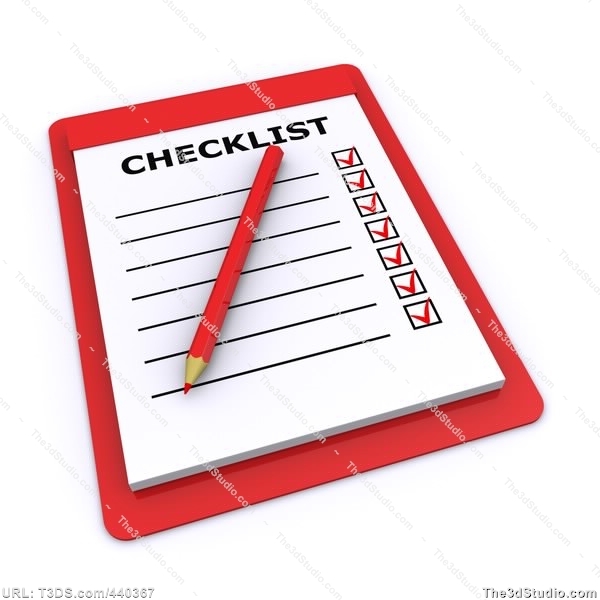 What is on your checklist, mental or written?